Rich Eso | Fresh Vinyl HQ! X-Plus 30cm Godzilla 2014 has landed!! X-Plus 30cm Manda (1963) RIC Exclusive Fresh Vinyl Review! Here is the Fresh Vinyl Review for the X-Plus 30cm Manda (1963) RIC Exclusive! There will be a photo gallery for this Kaiju coming shortly so check back in the X-Plus database under the Toho 30cm Series section, click on Manda and the gallery will be there (soon). Here are some shots to hold you over for now! FRESH VINYL’s TOP 5 X-PLUS FIGURES! Here is my top 5 favorite X-Plus figures! This was not as easy as many would think. With 70+ X-Plus figures to choose from, picking my top 5 was hard. Sure, the first 2 were pretty damn easy but spots 4 and 5 were a bit tougher. If I had to choose a top 10 list, it would have been easier to spread the love. Choosing 5 made me really think hard which ones I really love! I had to think back to the Box Day’s I had with these figures and how they made me feel upon releasing them from their plastic confinements, their Box Coffin! Once the Fresh Vinyl was released, I was in awe with these figures! The runners up for spots 6 – 10 were the Gigantic Seriers Burning Godzilla, 25cm Baragon (crawling), 25cm Mogera, 25cm, King Ghidorah and 25cm Godzilla 1973! Unboxing of the X-Plus 25cm King Ghidorah. Jeez…do you have a horror story about unboxing your King Ghidorah?! Leave your story in the comments section!! X-Plus 30cm Godzilla 2014 Teased! WOW! X-Plus just dropped a bomb on us! 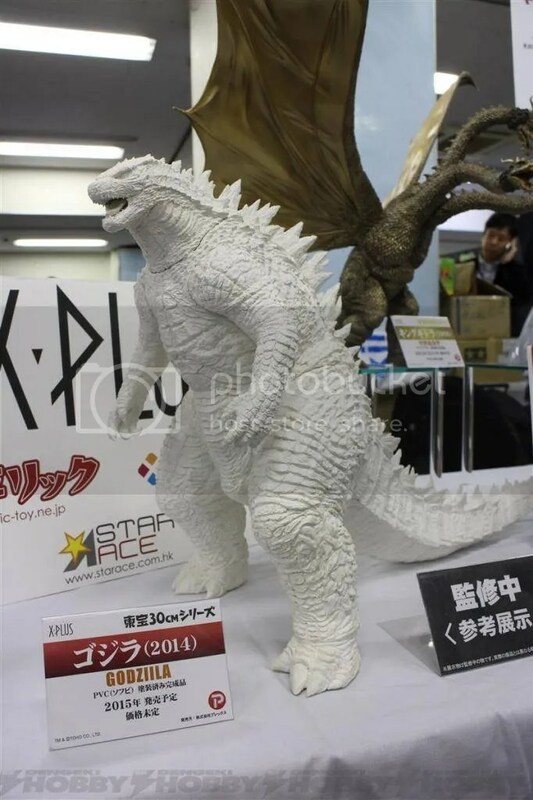 First the 25cm King Ghidorah and now this, a 30cm Godzilla 2014!!! Based of the placard that is placed just to the left of the prototype, this figure is coming sometime in 2015! This will be part of the Toho 30cm Series! For my own account, this is a highly detailed looking figure, but of course, it’s X-Plus!!! As far as pricing and release date, that is not known at the moment. In the past, most 30cm figures go for $160 + shipping, so I would think that is a safe starting point to budget for this guy. Keep you eyes open for retail sites like Hobby Search, Amiami and Hobby Link Japan as they will most definitely be releasing this guy! No word on what the RIC feature will be because it way to damn early. Maybe a Muto head, light up fins or…I don’t know! This is just a prototype guys! I am sure in the coming weeks we will get more pics and info on this figure! I can’t wait to see this painted up. As you can tell, yes I am excited! FRESH! Photo courtesy of Mike Russo via Toho Kingdom!